When looking for any deadbolt, knob, or lever product, it is important to measure the backset of the door on which it is going to be installed. This will ensure the lock you are purchasing will fit properly. The backset is measured from the center of the hole for the lock to the edge of the door. Most residential doors are a 2 3/8" backset, and industrial doors are usually 2 3/4". If your door has a different or non-standard backset, please contact us to see if we can accommodate your door before ordering. Some products feature an adjustable backset that can be set to fit either standard. Other products use completely different parts. In any case, we ask you to measure the backset of your door when ordering so that we can provide the proper part and set it prior to shipment. 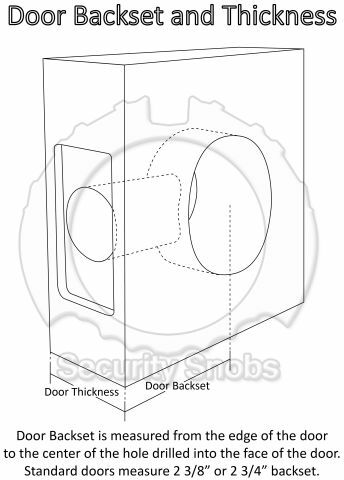 To help you determine what backset you have, please see our backset/thickness guide below. You can print it out and use it to determine what measurement your door is, or to assist with drilling a new door. Make sure to measure our guide prior to using it to ensure it is properly printed. While deadbolts can be installed on left-handed or right-handed doors without issue, some locks are specific to the handedness of the door. Our knob and lever locks are adjustable and made to work with both right and left handed doors. You cannot order the wrong one. 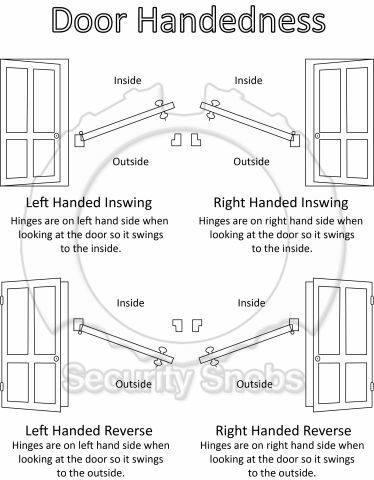 To decide if your door is left handed or right handed, look at the door from the outside (or so it swings away from you when opened). If the hinges are on the right, it is a right handed door. If the hinges are on the left, it is a left handed door.